Every day is an adventure and I never know what might get thrown my way. Besides big things like visas and permits, trying to plan more than a couple of days ahead is pointless and most likely won’t go the way I was expecting. It was starting to look like one of the big plans was about to get hijacked by the Karakoram Highway. To drive your own vehicle across China you basically have to go through a tour agency. The agency obtains all the permits to be able to self-drive, which are very expensive. They also get you the temporary drivers license and provide a guide who is mandatory. They need to be able to keep a close eye on you. 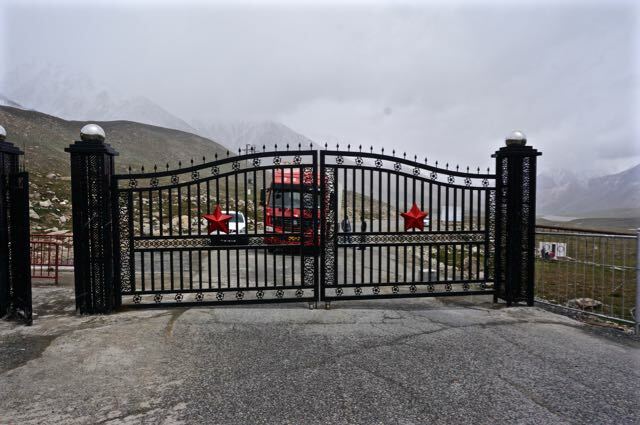 I only needed to get across a tiny piece of China through the Muslim Xinjiang Province on my way up to Kyrgyzstan. To do the cross as a single rider is very expensive, so the thing to do is find other overlanders online and group up to share the costs. Six of us hooked up and formed a group to go into China on August 10th, which included Harley, a couple from Australia and France on motorcycles (Dave & Ghighi, a couple from Australia and England in a Land Rover (Ben & Sofee), and myself. The price was way lower this way, but still a rip-off. Over the last week we had been hearing that the road up to the border was closed due to landslides. Everyone we talked to gave us another story and it was impossible to find out what was actually going on. The scenarios given to us varied wildly from being closed for fifteen days before it’s fixed or they had just been to the border yesterday and it was wide open. As soon as we were convinced by someone of the condition, somebody else would come along and give us a whole new story. I stopped listening to anyone and just tried to be optimistic that we would get through on our date. At Borith Lake we were getting more bad news than good, as the date approached. Apparently there were some massive slides and complete sections of the road which had fallen into the river. After three awesome nights at the lake we packed up early on Monday the 10th and drove the fifty km to Sost to meet up with the others. The regulars at the hotel laughed and expected to see us back in the afternoon. 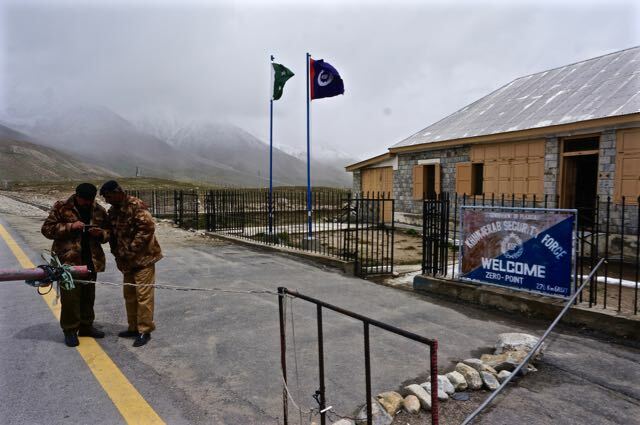 Sost is 82 km from the actual border, but it’s where Pakistani immigration and customs is handled. It’s a tiny little place that you pass through in twenty seconds. Just another border village providing some dingy hotels, drinks and snacks, vehicle repair, and random nick knacks. You can’t get chicken much fresher that this. Weigh it, kill it, pluck it, cook it. No middle man. Before finding them, I drove to the immigration office to get some info, which wasn’t what we were looking for. There were people around who had been waiting for days and it looked like it would be closed for a while to come. Harley and I met up with the others at their hotel and tried to figure out the next move. They had been up to one of the large washouts the day before and got in contact with the head engineer. He told them to come back the next day to get an update. They were clearing and rebuilding the road from the Pakistan side towards China. Nobody was coming from the other side so they had no idea what lay ahead of them. Some heavy rain and warm weather led to heavy glacial melt, which blew up the rivers. Besides the large landslides covering the road, there were long sections that had completely collapsed into the river. We had all been pretty excited for the next adventure and were feeling pretty down when a guy told us that it might get opened. We jumped on our bikes and drove up to find out more. After only eight km the wind was taken out of our hope balloon when we were stopped at a gate and told the road was closed. Ben talked his way into being able to drive up and talk to the engineer while we waited behind with the National Park rangers and a Snow Leopard. It was really sad to see such a magnificent animal caged up. They told us that when it was a baby it fell into the river and was rescued, and someday they will let it free. Who knows if thats true. The eyes are gorgeous and pure wild. Ben came back with bad news. We weren’t crossing anytime soon. Optimistically, the road wouldn’t be open for a few more days. 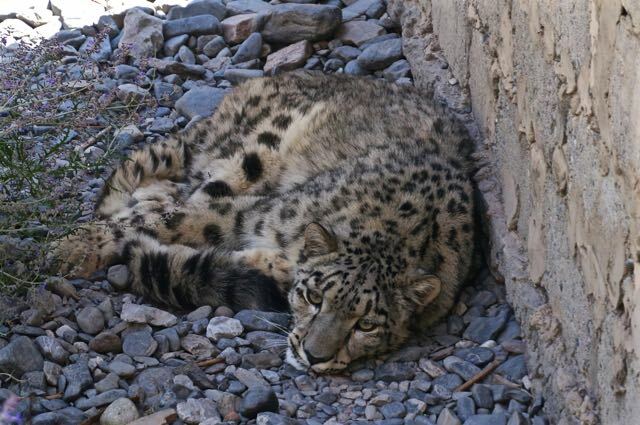 The Karakoram Highway had kidnapped us and decided we needed to stay another week. The cross has to start on a Monday or Tuesday so that you can cross the border out of China on Thursday or Friday. They close it on Saturday and Sunday, which is the first border I’ve ever been to or heard of that closes for the weekend. The worst part about missing our tour date was the agency had us in the palm of their hand. We had no choice but to reschedule for the following Monday, and according to them, re-apply for the crazy expensive permits. Apparently, this time they would get a permit with flexible dates on it in case the road was still closed. I don’t understand why this wasn’t gotten the first time and it felt like we were getting screwed, but nothing we could do. They got us for another $411 each. The China cross is definitely the most expensive part of the entire trip, apart from breaking my leg. It was a bummer not to leave that day, but it turned out to be a mini-blessing in disguise. All of us were definitely at a point of needing some chill time and to stop in one place for a bit. The decision was easy and it was back to Borith Lake. Another week to live in heaven. The grass hadn’t even had time to recover before Harley and I put our tents back into their same spots under the apple tree overlooking the lake. Everyone gave us a look of told you so and welcomed us back. The next week was perfect. Eating good food, swimming, sunsets and sunrises over mountains, star-filled nights, hiking up to the glaciers, exploring the area, and making friends with all the Pakistanis on vacation to the north. 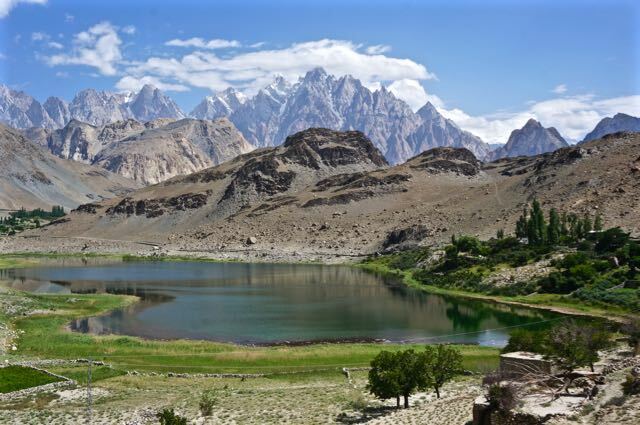 If you’re looking for a place to escape from it all then Borith Lake and Gojal are the spot for you. The only modern convenience you’ll find is the electricity that seldom works and gas to cook the food. 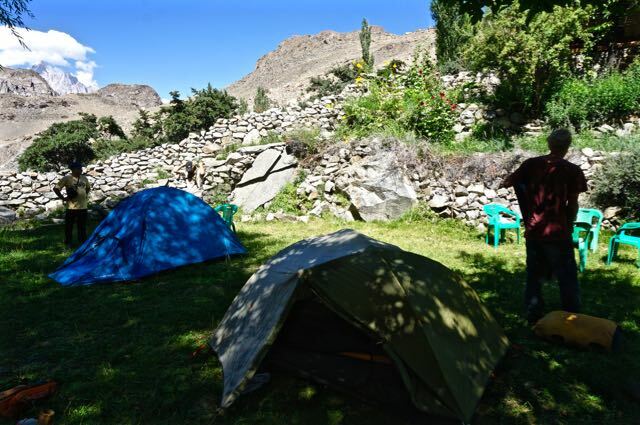 One day, with a bit of itchy feet, I took trip back down to Karimabad and lower Hunza just to get out and do something. The day was filled with hitching rides on the back of little Honda motos, having tea with strangers, enjoying Attabad lake again, riding on the top of mini-vans, and taking in the beauty of it all. 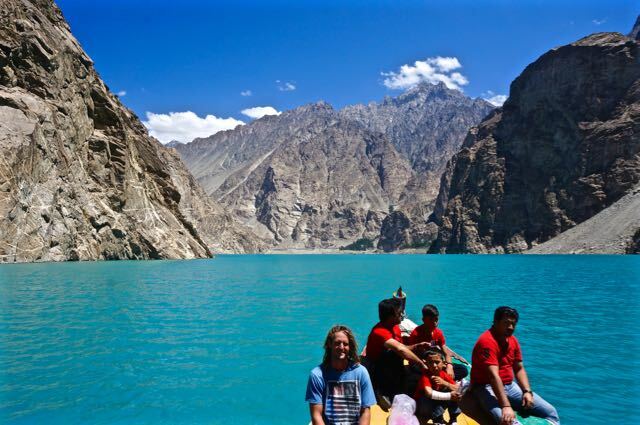 The best part was getting to take the ferry across Attabad lake again, which was just as beautiful the second time. Right now it only costs a dollar for the hour-long ride, but as soon as the new road opens, it will be exclusively for tourists and the price will probably sky-rocket. Good to enjoy it now with all the locals and interesting people to talk with. I didn’t have to pay either way because of friendly Pakistanis. On the way back across the lake, heading to Borith, I got to talking with a Pakistani guy with great english. He was traveling on his Honda 125 from Islamabad up the Karakoram Highway to Kunjerab Pass. A friend had bailed out on him and he was forced to do it alone, but he had a good adventurous spirit and was embracing it. In this part of the world it’s seems strange to a lot of them to travel alone. They worry about something happening or needing help. He didn’t have these reservations though and was seeing a part of his country he’d never been to. If it wasn’t for a wife and kids, he would be doing a lot more. As we were talking, I saw a lightbulb go off in his head. He asked me, “are you the guy with ammo can panniers on your motorcycle”. What a crazy coincidence. Turns out he works security at the US embassy and had seen my bike when I was there. He had waited for me after his shift, but since I took so long, he gave up and headed home. 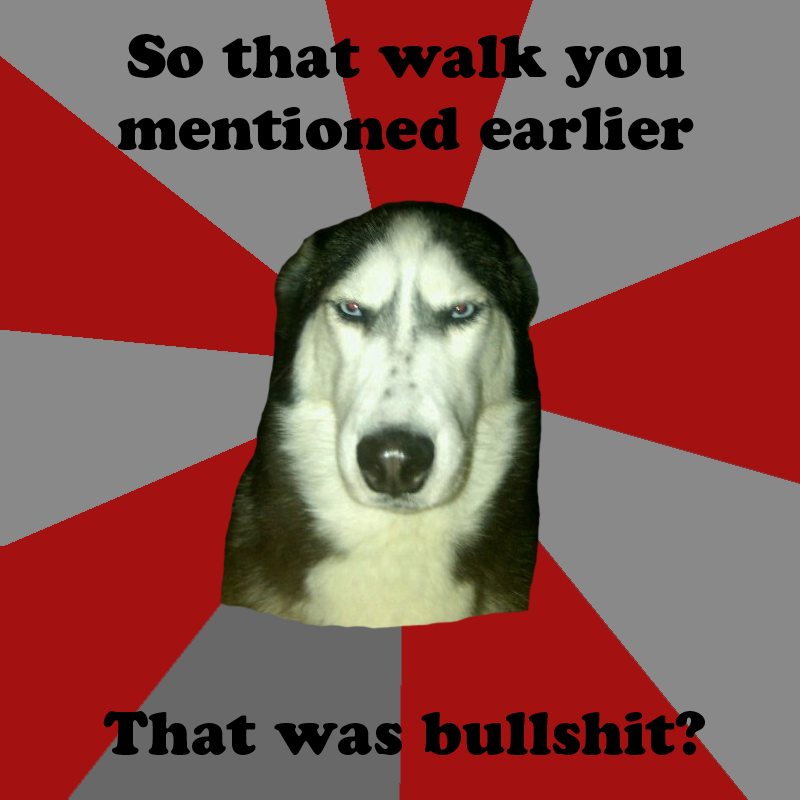 From our conversation, he realized it was me, or maybe he was sent by Obama to protect me. We struck up a friendship and laughed about how everyone at the embassy told me I was insane to come up here. He took a pic of the two of us crossing the beautiful lake so he could show everyone who had tried to scare me. He gave me a ride to Borith and ended up staying for a couple of nights. 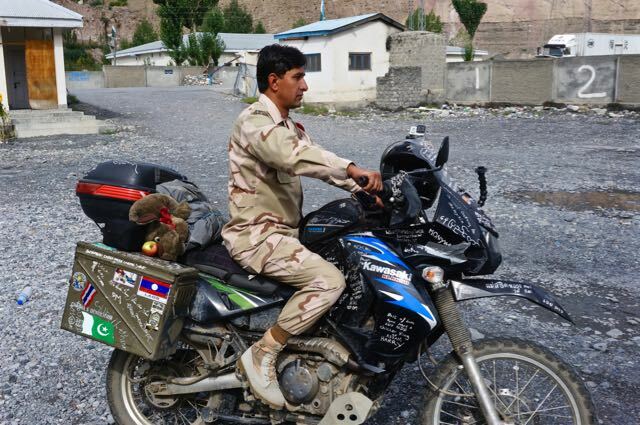 I took a ride with him on Friday up the Karakoram half way to the border to check out the road condition. It was clear and open for traffic. As long as another slide didn’t happen over the weekend we were golden. The week went by in a flash and it was time for a second try at the pass, which is the highest international border that you can legally cross in the world at 4,700m (15,400ft). Before leaving Pakistan there was one thing left to do. 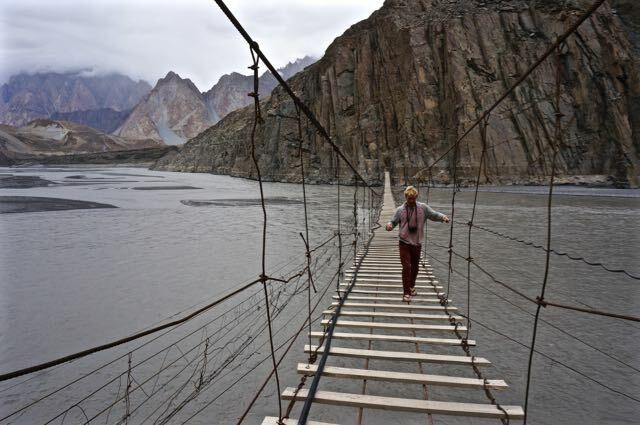 Down the hill from Borith Lake, spanning the Hunza Nagar River, is a ridiculously spooky bridge. 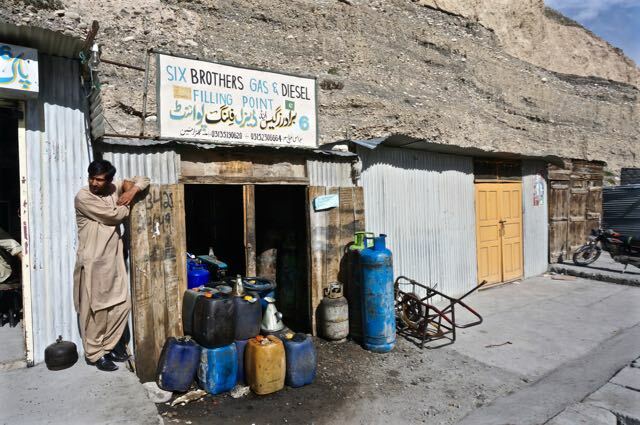 You can’t leave Hunza without walking to the other side and back. Locals trot across it like a breeze carrying massive bundles of wood, grass, and sometimes a baby. It’s one thing that a few cables are precariously holding the thing up over a rushing glacial river that would give you hypothermia in a flash, but what makes it so spooky are the spaces between each plank. Maybe to save money, when they built it they left big spaces between each board, and the boards that are there aren’t the widest. The part that really got the blood pumping was out in the middle where the water is violently sloshing underneath you and the river bank to either side is a long way off. It’s irrational fear all in your head though. The second time across on the way back is a piece of cake. I even took a little jog across it, at the end where it wouldn’t mean certain death if you fell. Along the side of the bridge are a mangle of cables that go from one side to the other. Out in the middle they’re half submerged into the river. 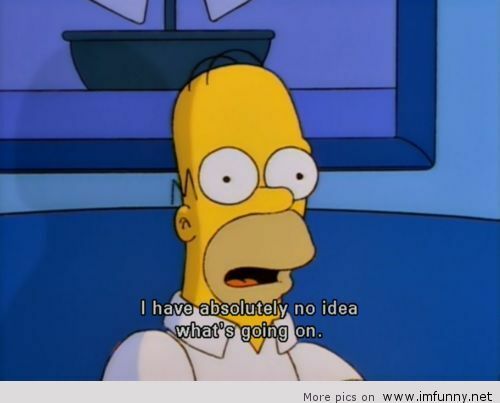 There’s a guy at the hotel who showed me pictures of him crossing on the cables. He tried for ten days to get me to go do it, but I’m way too chicken. On Monday, August 10th, we began our trip to China via the Kujerab Pass. There were a lot of people waiting at the customs and immigration building, but we were taken in first. The customs agent handled the carnets and then the Narcotics Officers searched the bikes and Land Rover. It seemed like more of a formality and they were more interested in checking out my motorcycle and getting a picture with it. Next they took us into immigration to get stamped out. The officers in there were sincerely friendly and easy-going. The Chinese immigration and customs would be a complete contrast to Pakistan’s. They did force us to take the Polio vaccine, which is a couple drops into the mouth from a little plastic vile. If you stay in Pakistan for more that ten days you must have it, but it was confusing. I thought a vaccine would only work to protect you against a disease, not if you already have it, but I’m not a real doctor. Pakistan is one of the last countries in the world with a polio problem and they’re working hard to change that. Once finished, we were free to make our way up the Kunjerab Pass to China. 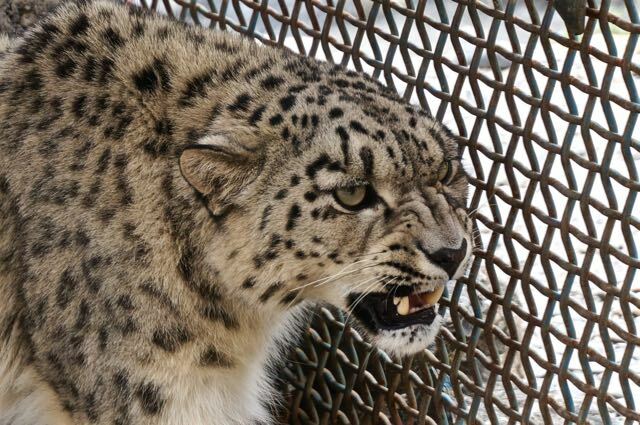 I stopped one last time to say goodbye to the Snow Leopard, but it wasn’t in the mood for mushy goodbyes. It’s a pretty ride up to through the valley. The first section is right along the river, which is where the road damage had been. There were many sections where you could see a landslide had been cleared. The sections of road that had fallen into the river were built back up with hundreds of truck loads of rock. The work that they did on the road in such short time was amazing. I’m grateful to them for working their asses of day and night to get it re-opened. It was Pakistan’s Independence day and they kept on working while the rest of the country was off work celebrating. 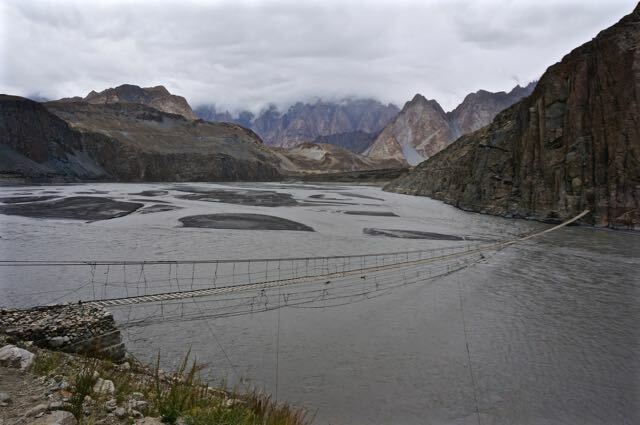 Eventually, the Karakoram Highway leaves the river and starts the climb up to the pass. The temperature steadily dropped and the clouds grew thicker. Switchback after switchback led us closer until we were delivered to the top of Kunjerab pass and the final Pakistani checkpoint. The warm smiles and friendliness of the two Pakistani officials would be some of the last for a while. They checked our passports, gave a goodbye handshake, and sent us off with a wave. Another couple hundred meters past the gate is the big Chinese entrance. This is the the very top of the pass. A Pakistani soldier stood watch with a Chinese one close by. He wanted a couple of pictures with us and was very friendly. The Chinese guy on the other hand was a jerk. He was standing there taking pictures of us, but when we tried to get a picture of our bikes underneath the arch he started freaking out on us. I still managed to get one. 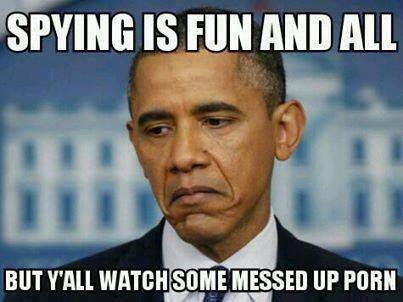 In situations like that it’s best to act oblivious and just smile about everything. Success. 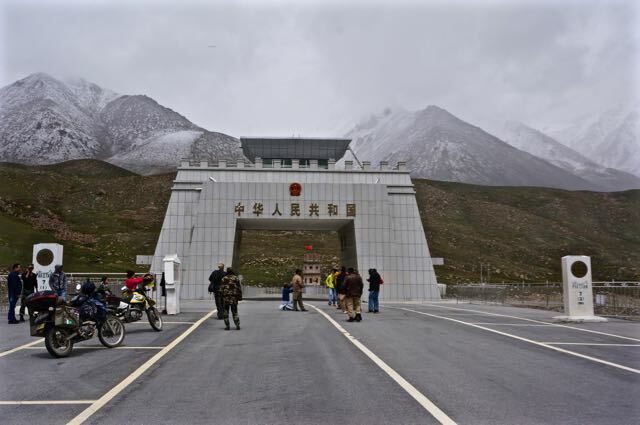 We had made it to the Chinese border, which seemed like a big accomplishment, but the biggest challenge lay ahead. Getting through Chinese customs and immigration. Pakistan was an amazing experience that opened my eyes. Like I said when i entered, I wanted to get my own feelings for the country and not what the news told me about it, and I feel like I accomplished that. I loved my time and look forward to seeing it again someday. This entry was posted in adventure travel, border crossing, camping, Kawasaki KLR650, Motorcycle world travel, pakistan travel, Photography and tagged borith lake, china border, crossing, glaciers, gojal, hunza, karakoram, kkh, kunjerab, kunjerap, motorcycle, pakistan, pass, photography, travel. Bookmark the permalink. Superb blog n post. Im really enjoying it and thanks for your true feelings about pakistan. stay blessed. Wow the water color in Lake Attabad looks like Crater Lake. Beautiful! Looking forward to “the rest of the story” in China.